The sky is endless blue, interrupted by just a few cotton-wool clouds. High above the ranges I can see the outline of a wedge tail eagle spiralling on a thermal as it searches for prey. Once these majestic raptors were a common sight throughout the Flinders but with the decimation of the rabbit population their numbers have dropped. Today they hunt for more indigenous prey; wallabies, lizards and road kill from the many tracks that meander through the ranges. As I carefully steer the vehicle around another corrugated, gravelly bend, I catch site of a kangaroo standing motionless in the long grass. Easing to a stop, I wind down the window and take a closer look through a telephoto lens. 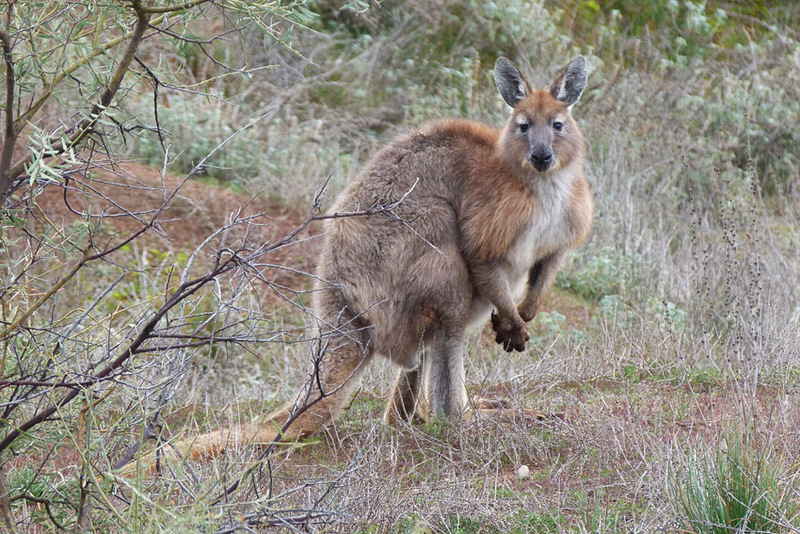 The powerful, compact body and rusty brown tinge to its fur immediately mark it as a euro or hill kangaroo; a species that lives amongst the rocky outcrops rather than on the plains. 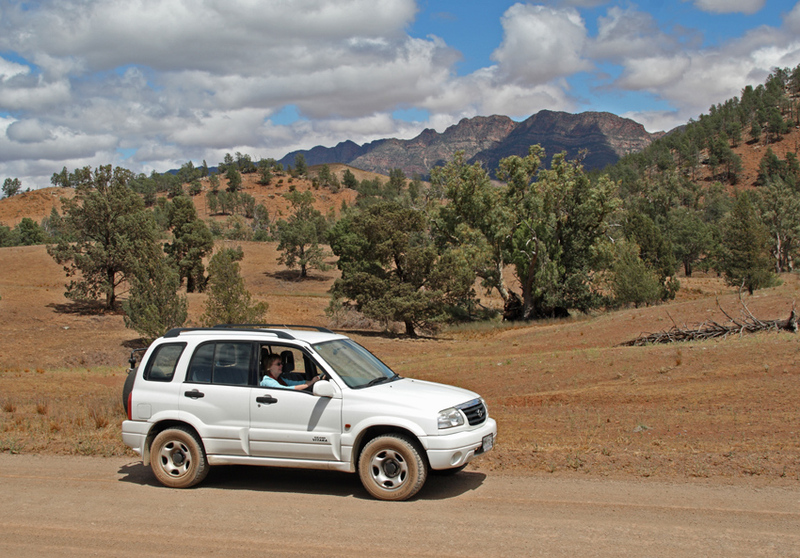 I am driving the Moralana trail, a 30 km dirt track that cuts across the Flinders Ranges, 40 kms south of the iconic bush resort of Wilpena Pound. The track is flanked by the jagged peaks of the pound on one side and the Elder Ranges on the other. It is an easy drive compared to the trails that follow the gorges further north yet there is a proliferation of wildlife ranging from flocks of cockatoos to echidnas and several species of kangaroos. We leave the euro feeding on some low bushes and continue our drive. A few kilometres further on, half hidden amongst a stand of pale barked eucalypts, I notice a rough cut log corral by the roadside. Closer examination reveals a plaque explaining that the structure is a restored ‘cueing’ or shoeing station. In the 1870s it serviced the bullock trains that hauled native pine logs which were then cut for the construction of the overland telegraph. 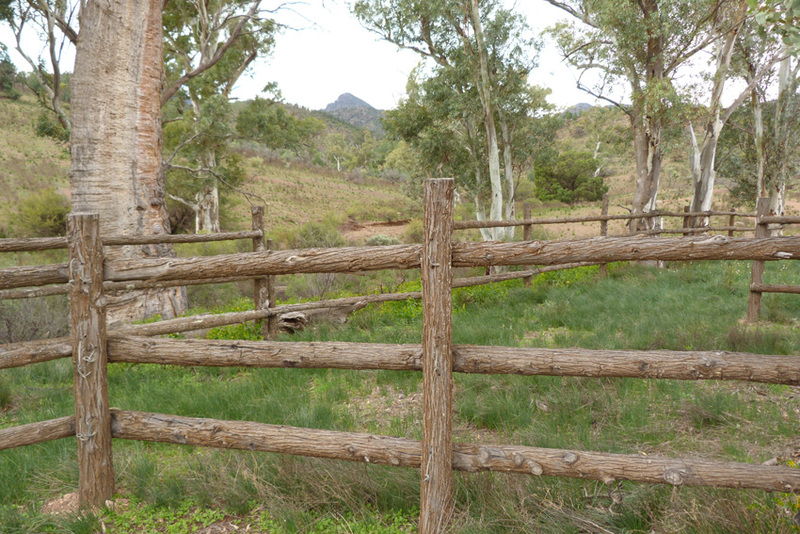 The corral is just one of the many historic sites that remind us of the hardy pioneers who lived and worked in the Flinders during the state’s early years. After a long day’s driving, the cueing station seems a perfect place to stop for a late lunch and enjoy home baked meat pies and sausage rolls, purchased earlier in the day at a country bakery on the drive from Adelaide. The afternoon sun is dropping low in the sky and it is unwise to drive these tracks in the evening as the roos become more active and 50 kgs of kangaroo smashing into a vehicle does neither animal nor car much good. I ease my foot down on the accelerator, the dust billows behind us and we continue our journey along the track. We catch sight of more kangaroos in the distance; they are probably western greys or reds. Suddenly, a pair of emus emerge from thick scrub alongside the road and for a few minutes the huge birds keep pace with the car before heading back into the bush. According to the map we are only a few kilometres from the junction with the Wilpena road when we slow for a broad, dry watercourse that cuts across the road. I turn the car into the creek and engage 4WD. We bump and slide over the round pebbles and avoid the larger boulders as we drive a couple of hundred metres along the creek and venture out for a final forage in the bush. We are not disappointed. 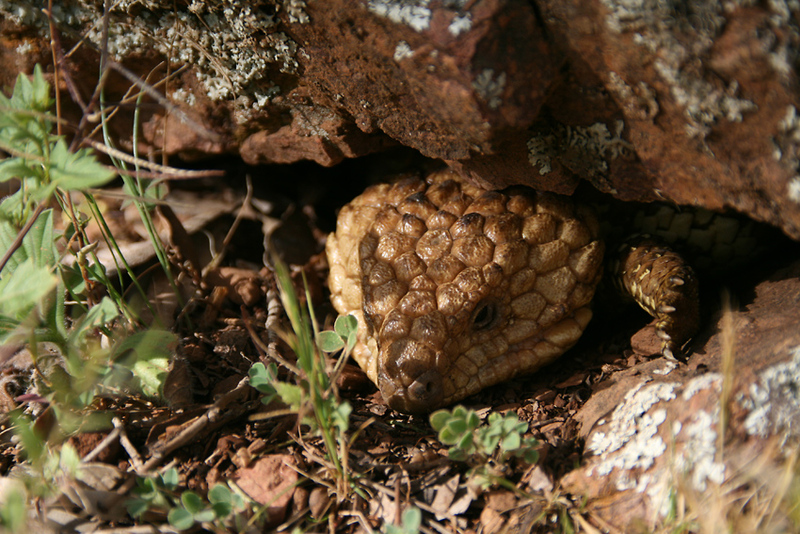 On the dried out bank, wedged into a tight crack between some flat rocks, we come across a sleepy lizard which, judging from the snail shells close to its refuge, has made this little niche its home base for some time. The sun is low now, the light soft but Moralana has one more moment in store for us. Close to the junction with the bitumen road, a small herd of wild horses are grazing near the fence-line. 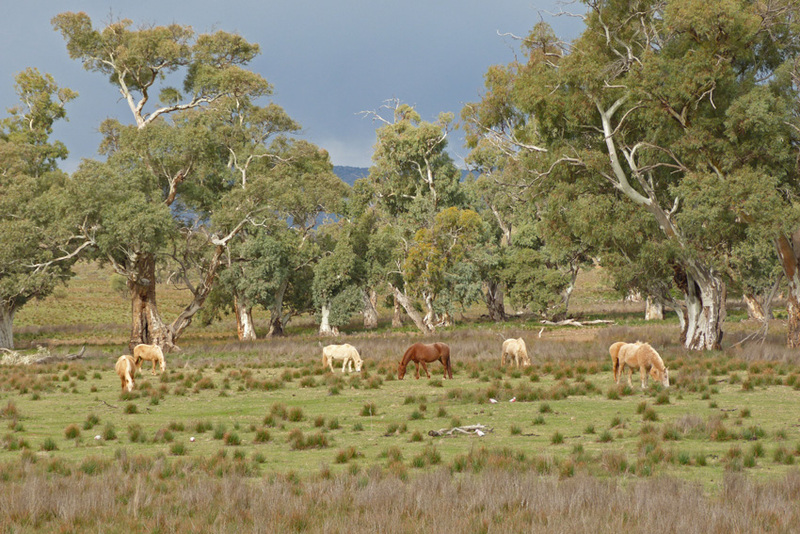 Whether these are true brumbies (Australian wild horses) or stock that is herded periodically for riding, I am not sure… but whatever their origin the very presence of these elegant animals was the perfect parting gift.